Disclosure: All the Dab Wax Pens which we review on this website are tested by our trained, paid staff. As part of the review, VapingDaily.com links directly to the product or brands so that you may purchase directly from the provider. We receive commissions from these providers, however, this does not affect the price you pay, and the commissions we earn help us pay for the costs of running this website. Click here to learn more. Thank you. Best Value in a Below $50 Combination Dry Herb/Wax Concentrate Pen That’d Hard to Beat! The Mig Vapor Yabba Dabber is unarguably the most affordable ($42.95) vape pen. It will allow you to vape more than one medium. From refilling to using to cleaning, everything is a snap. It will not disappoint you if you expect supreme performance from the pen. This is even at such an affordable price. You can grab it at the lowest price from the MigVapor online store or read on to learn more about it. The Mig Vapor Yabba Dabber is an ultra-compact vaporizer pen. In fact, it boasts the newest and most advanced technology. 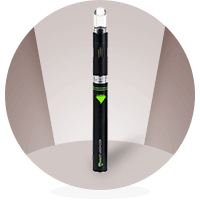 This way, it gives users a quick and discreet vaporizing experience. The pen is good overall value for entry-level dabbers who want to do a quick toke on the go. Moreover, you can choose between vaping dried herb or wax concentrates. Therefore, expect to get great vape-build across a broad range of wax consistencies. Mig Vapor has released some great products in the past, and the Yabba Dabber lives up to the expectations. The Mig Vapor Yabba Dabber comes in a discreet matte black finish with a green diamond-shaped button and a glass mouthpiece. It looks good, and the build quality feels sturdy and functional. The unit measures 1.5 x 1.5 x 6, making it discrete and easy to conceal. Make sure that the pen is off, then load your dab, shatter, or herb into the compartment. Once you packed the unit, click the button five times. What Makes the Mig Vapor Yabba Dabber Great? The advanced ceramic heating plate can bake between 400°F, and 455°F. What’s more, they designed the Yabba Dabber for using dried herbs and concentrates. The 500mAh battery is bigger than other combination dry herb/wax pens in its price range. In addition, the True Convection Technology gives the user great vape flow. The vaporizer uses a wireless USB charger, which charges your device in less than two hours. This is compliments of the Mig Vapor’s Ego Thread quick charging port. The device is relatively easy to use. You can easily unscrew the two main pieces to load the chamber. Also, you can screw it back on again. Five quick clicks and two to three seconds later, and your vaporizer is ready to use. Remember to charge your Yabba Dabber before using it for the first time. Furthermore, make sure that the pen is off before you take it apart. Otherwise, you may hurt yourself. When using the Yabba Dabber, the user must keep in mind that the power button is a straight fire button. This means that you should only press it until the substance activates. Keep pressing the button for longer than needed will result in the device getting too hot. As a result, you will burn your concentrate. The user must develop a feel for the device, as there is only one heat setting. Different concentrates use different temperatures. The user is in control by pressing the button long enough for the desired temperature. It isn’t usual to get a visible cloud when vaping with a small sized vaporizer. The unique ceramic heating plate makes the Yabba Dabber stand out from the crowd. That’s because it produces big, flavory clouds which we didn’t expect all. Depending on how often you use it, the device’s battery should last an entire day. It’s true that it can take any substance. However, the Yabba Dabber is primarily a wax concentrate vaping device. When used with dry herb, it is important to remember to hold the pen upright. This way, you can prevent the herb from falling out of the ceramic chamber. Take care when using the Yabba Dabber. It’s important to only apply the necessary heat needed to vaporize the substance. Then, release the button. Try to always carry batteries in a battery case, never near a loose or metallic object such as keys and coins. Always keep your Yabba Dabber’s battery dry and away from water and don’t expose the battery to an open flame. You should fully charge the battery before first use. Also, if you’re planning on storing the batteries for a while, charge them up to around 60%. To keep your battery in good shape, always first wipe the connection with a paper towel. this way, you can check if you haven’t overfilled the tank. This ensures a clean and dry battery connection. When it comes to the cartridge or tank, the same rule applies. After filling the tank, blow through the hole. If you hear a gurgling sound, it means that you have liquid in the air tube. Blow further until you can wipe the excess e-liquid off using a paper towel. Remember to clean out the mouth piece as well. Most wax pens don’t allow you to smoke dried herb. Therefore, this feature won us over on this pen. The performance is outstanding for a vaporizer of such a small size. The device is portable and discreet and provides smooth and clean aroma. At a price of $42.95, the Mig Vapor Yabba Dabber offers great value in a multi-purpose dab pen. Our Cloud V2 Paragon Review details the high-level features and the performances of this exciting device. Read here to find out more! The Mig Vapor Keymaker takes vaping concentrates to a whole new level – despite being one of the smallest wax pens available on the market.